Do High School Walkouts Suggest Generational Resistance to Trump? 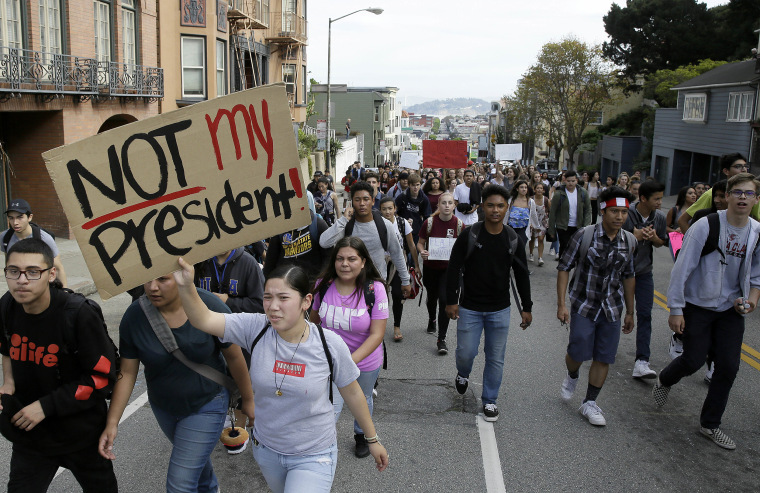 Thousands of high school students across America, many of whom were not old enough to participate in this November's presidential election, are nevertheless making their opposition to the results known by staging organized, symbolic walkouts at their schools. The diverse array of students, who have come of age during the tenure of the country's first black president, Barack Obama, are now faced with the stark contrast of President-elect Donald Trump, whose controversial social and economic proposals could have a direct impact on their lives and futures. On Wednesday, several hundred students from Blair High School in Silver Spring, Maryland, left their classrooms Monday in a peaceful demonstration, slowing down traffic in the process as they marched past a busy thoroughfare. Students in Los Angeles planned a similar action later that day — a week after thousands of students across Los Angeles County walked out of schools in post election protests. Citing Trump's call deport all undocumented immigrants, end the Affordable Care Act, and to ban Muslims from entering U.S., among other policies, the organizers of the L.A. walkouts said in a statement that they want to pressure their local elected officials to do "everything in their power to protect and support all vulnerable communities." "I am deeply inspired by the courage of these Eastside youth who are standing up against hate, bigotry and racism," East L.A. community member and activist Nancy Meza told NBC News in a statement. "These young people are taking a stand and demanding respect and dignity for the communities they belong to. They are a clear hope for a brighter future in these troubling times. " However, L.A. schools superintendent Michelle King has a very different take. "These are important conversations that need to take place. We want our students to know they are not alone," she said in a statement on Wednesday. "However, it is critical that students not allow their sentiments to derail their education or for their actions to place them in danger." "Students should limit their activities to non-instructional time and — for their own safety and to follow the law — they should remain on campus," she added. Critics of the protests, including Trump himself, have suggested that protesters are being ginned up by outside forces, either by an allegedly biased press, or in the case of young people, their progressive parents. But Kei Kawashima-Ginsberg, the director of CIRCLE (The Center for Information and Research on Civic Learning and Engagement, an organization with researches the political engagement of younger Americans, that premise is a far-fetched one. "Young people are most influenced by their peers, not the the media and certainly not their parents," she told NBC News. "I think this is an expression of the frustration many young people felt because they didn't get to choose their president." Those that did vote overwhelmingly backed Democratic nominee Hillary Clinton. A result that Kawashima-Ginsberg also saw borne out in mock elections among underage citizens around the country. Although there are certainly some young people sympathetic to Trump's message, Kawashima-Ginsberg believes younger citizens are by-and-large less uncomfortable with demographic changes in this country than older generations of Americans. "Young people of today are much more diverse than the young people of yesteryear," she said, pointing out that it is far for common to grow up alongside someone who is openly part of the LGBTQ community or an immigrant from a Latino country than it might have been a generation ago. "For young people that's really just a reality, not something they have to deal with," she added. "They are part of these communities." And in light of reports of bullying and abuse of minorities in the wake of Trump's victory last Tuesday, for members and allies of those communities, it's personal as well as political. Meanwhile, while law enforcement officials did not crack down on the student activism in Maryland they expressed some concerns about the physical safety of protesters, who is some cases were walking and running in the street, perilously close to traffic. And a separate statement from the LAPD warned that protesters were subject to arrest if they obstructed movement of vehicles and people, committed vandalism or refused to disperse if unlawful assembly is declared. However, the protests themselves did not descend into violence and so far no arrests have been made. According to Delia Goncalves, a reporter from local CBS affiliate WUSA9, one student who was not quite of voting age told her that although they may not have been a factor on Election Day, they had a right to express themselves. "We are the future," they said.